Do not rely on technology if spraying conditions are not within reasonable limits. Although new drift reduction technologies are evolving, most technology will not control all drift. Even the best technologies produce some drift that must be managed. 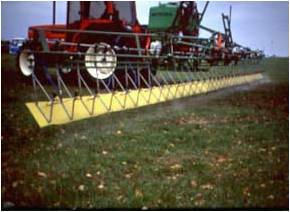 Boom shields can take the form of tower sprayers, wrap-around sprayers, tunnel sprayers and hooded sprayers. 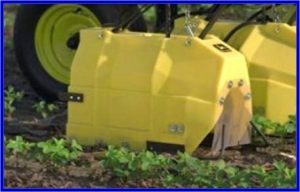 While shielded sprayers often reduce the potential for drift, they may also have potential problems. Some shields do not allow the operator to view the nozzles to determine if they are operating properly. Solid shields operated at higher speeds may act as an obstruction and force air to flow over the boom shield, which creates turbulence on the backside that could pick up small droplets and carry them into the path of the wind. If the sprayer is traveling with the wind at the side, spray can be pushed out the downwind side of the boom. Properly designed shields, operated at moderate speeds, may reduce drift potential, but they still do not allow you to spray in adverse wind conditions. 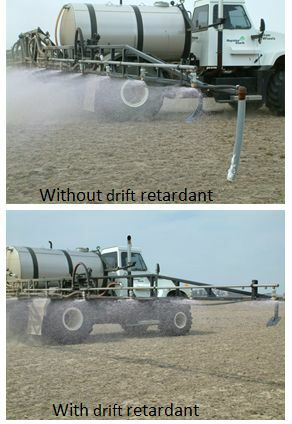 Many drift retardant products are on the market, but do not assume that one product will eliminate all pesticide drift. Some products breakdown after a period of recirculation through the pump and agitation. Some work well with one active ingredient, but not with others. Some may affect the performance of surfactants and other adjuvants that are formulated with the pesticide product. And some distort the pattern in air-induction nozzles. Approach the use of drift retardants with an understanding that each product must be evaluated in each situation. Electrostatic spraying systems are designed to electrically charge the spray solution so that each spray droplet will be attracted to the plants. Although this technology has been on the market for some time, modifications to the charging mechanism have generated renewed interest. Appropriate droplet size is still important. If small droplets are moved by air currents, even the charged droplets may not come close enough to the plants to be strongly attracted. Initial compilation courtesy of Jim Wilson, PhD.